The Baleen sank on October 31, 1975 in rough seas while towing a barge containing heating oil. The sinking of the Baleen was the result of a fire that began in the engine room when the turbo charger failed and caught fire. 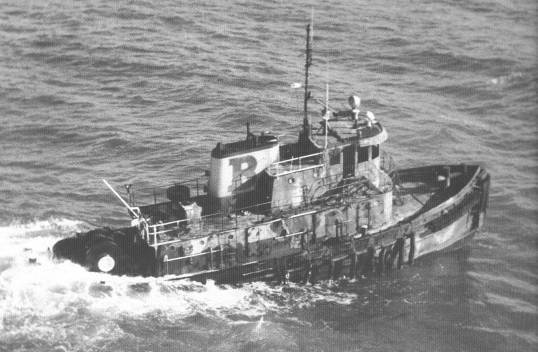 The crew of six abandoned the tug once the fire burned out of control. Fortunately all were rescued from the tug by a Coast Guard helicopter. As the Baleen burned and fire fighters battled the flames, it was taken in tow, headed for Boston. The oil barge was salvaged and was towed into port by the Coast Guard. After burning for approximately 16 hours, the Baleen finally sank before reaching the port of Boston. For many years, the Baleen was nearly completely intact with the wheelhouse and main deckhouse standing. Over the years, it slowly collapsed with the wreckage sliding off to the starboard side. Unfortunately, the upper structure has completely collapsed and there is nothing left but the hull, listing to starboard. There is the remaining debris off to the starboard side, but it is largely a jumble. The wreck can be reached in about 150-155 fsw of water with max depths at high tide around 170 fsw.